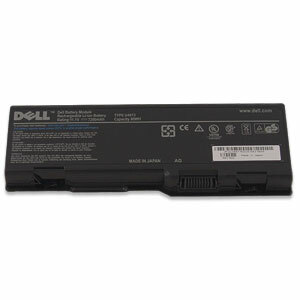 Genuine Dell 9-Cell Lithium-Ion Battery for Inspiron , Precision & XPS. The Dell 9-Cell Lithium-Ion Primary Battery has internal circuit board with chips that allow it to communicate with the notebook to monitor battery performance, output voltage and temperature. It also gives the notebook much more accurate 'fuel gauge' capability to determine how much battery runtime is left before the next recharge is required. • Weight/Dimension: 1 lb / 8.25" x 2.8" x 0.85"
Take care of your laptop battery and ensure that it will be ready to work properly when you need it most. Some general tips for laptop care include: avoid extreme temperatures, don’t leave a laptop outside in cold weather or leave it in a hot car. Cold batteries can’t create very much power and hot batteries will discharge very quickly. Use electrical power when available to keep battery charged. Don’t let your laptop go for long periods of time without using the battery.